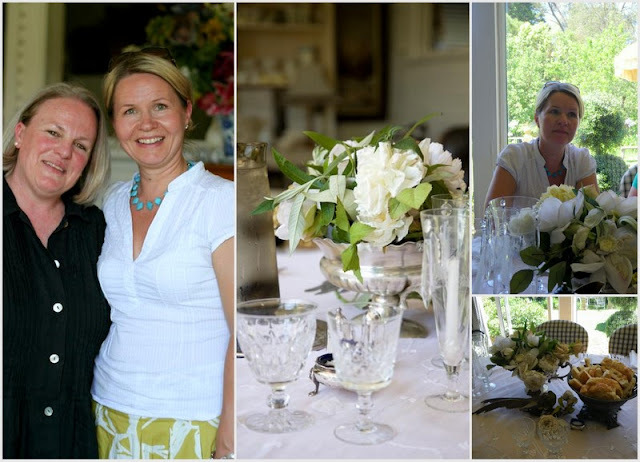 Over a year ago I received an email from my good friend, the very talented and gorgeous Minna Mercke Schmidt from Blomsterverkstad blog in Sweden, saying, Coty, I'm coming to Australia next year to visit my sister and we must get together. 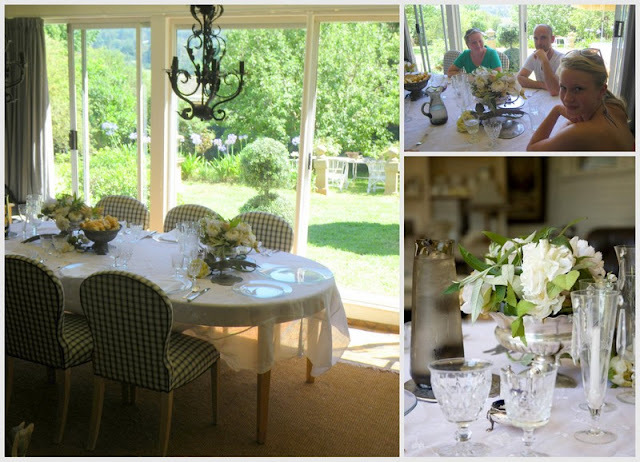 I was absolutely thrilled and on Saturday & Sunday we prepared and cooked a special "Summer "lunch for Minna and her family. 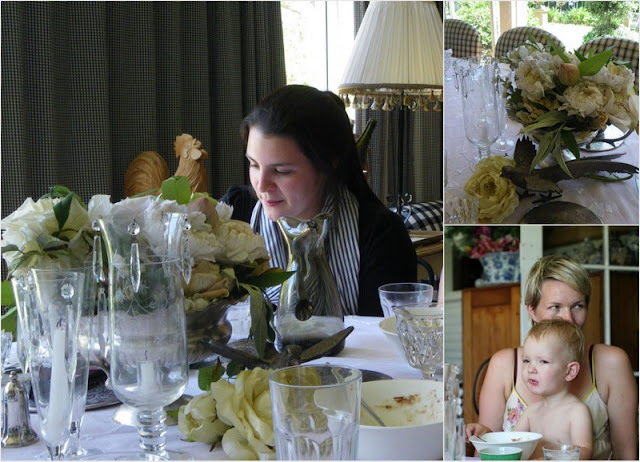 Her two teenage children, Minna's lovely mother, her sister and brother in law and their gorgeous little baby boy all drove down early Sunday morning from Sydney to our home in the Southern Highlands for lunch. I'm sure everyone already knows Minna and her blog, I certainly have always loved her work and her beautiful country home in Sweden. As both Minna and I are photographic Stylists we have been communicating for quite a while about our work, our homes and just about life as busy working mums. Minna is a lot younger than me, as you will see in the photos below, and she is just as I had expected her to be, very beautiful and caring and all her family were just delightful. Minna is also the very first blogger that I have ever met in person and now I just want to meet all my special blogging friends, it's fantastic! It was a really hot & humid summers day here on Sunday so I set the table in our sun room, above Minna and me(I'm the old one in black) It was so hot I had three fans blowing air around the room and all the birds outside seemed to be hiding in their nests throughout the whole day and they didn't come out at all, I was amazed as our garden has been full of birds feasting on our fruit trees all week. It would have been so nice to have all our Australian birds in the trees all day for them to see. Oh well, I put a couple of birds on the table instead along with my two urns filled with vintage flowers. Preparing the dessert with Thomas and Bec above in the kitchen, luckily Minna had her camera out snapping all day to get most of these photographs, as I was too busy chatting with everyone and there was no time for me this day to take many photographs. The delicious chocolate swirled cheesecake above was made especially for Minna by my friend Vicki, she is so good at making puddings and I asked her if she could make one for us, she's so clever. 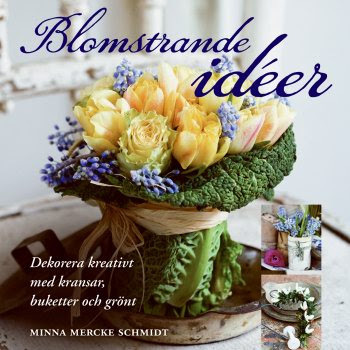 Minna is just about to launch her first book "Blomstrande Ideer" in March filled with all her beautiful images. Many, many orders have already been taken by her publisher and I can't wait to get my own copy. Work is also underway on her next book as well, click on the book below to go to Minna's blog to get all the details about her new book. As Minna flies back to the cold weather in Sweden today, I say farewell to my dear friend and how wonderful it was to meet Minna and her family. I know my family all found the day quite a wonderful experience. I really wished we could have spent much more time together as planned so I could show you some of my favourite styling spots. Minna did say she will be back as soon as she can, but as Andrew said over lunch, we are so lucky to have met and become good friends through blogging over the last year and half and we can always keep in touch most weeks through our blogs. 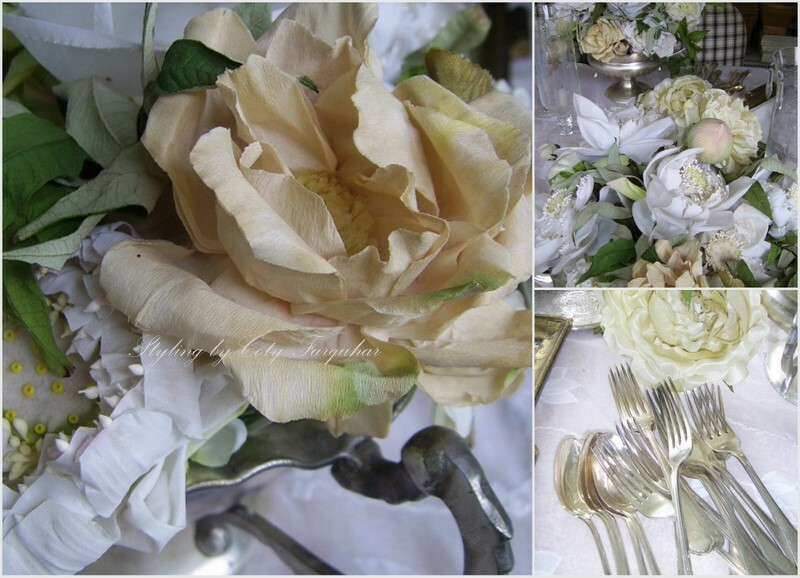 Come and visit some beautiful blogs showing their winter tablesettings today. Hello Coty - and Minna - I can see it is so hot...you are all red with the warmth, but what a lovely photo's of you all and your house is so great. You look like me, Coty ! But your creativity and crafts are much greater: i couldn't do decoration so beautifully. But we call people like us, who love the good life and love beautiful nice scenery and good food and drink and entertaining guest, we call them Bourgondiërs, referring to the love region in France Bourgondie, where life is wonderful. We are trapped in snow. My daughter is in Sydney, she will leave for Thailand at the 19th at the end of februari she will return to Australia. ( I am a little yealous, really, can you tell ? 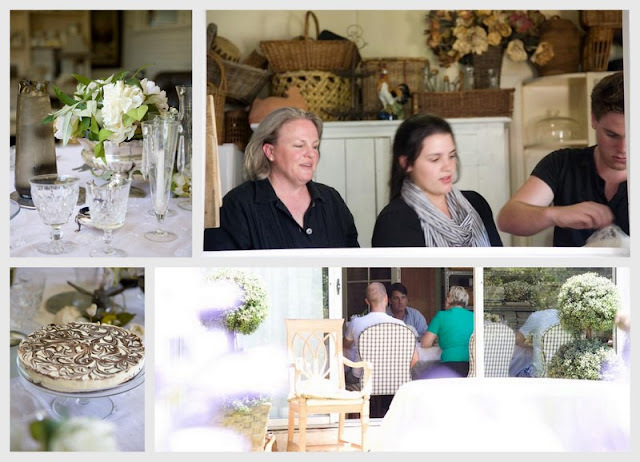 I so enjoyed the pictures of your get together with Minna and her family. I can see how happy everyone is and what a great time all of you had (all the smiles!!). 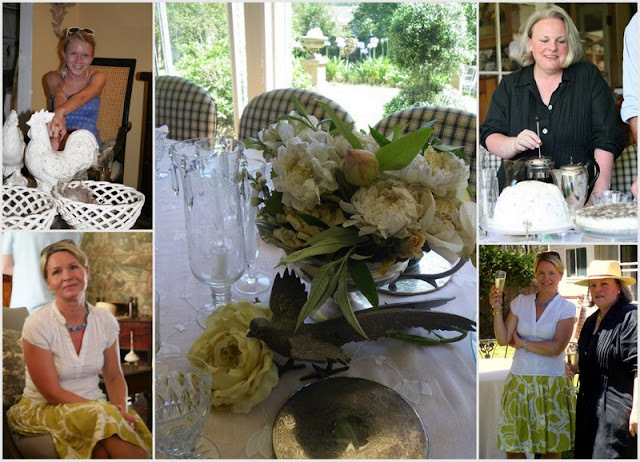 Your table looked absolutely stunning and of course, I love your home and garden. The picture of you & Minna together is delightful...you are both beautiful women!! I hope the weather cools off for you, Coty, and that you enjoy the rest of your summer! How exciting that you met, not only a fellow blogger ... but one who shares so many of your skills, interests, and talents! 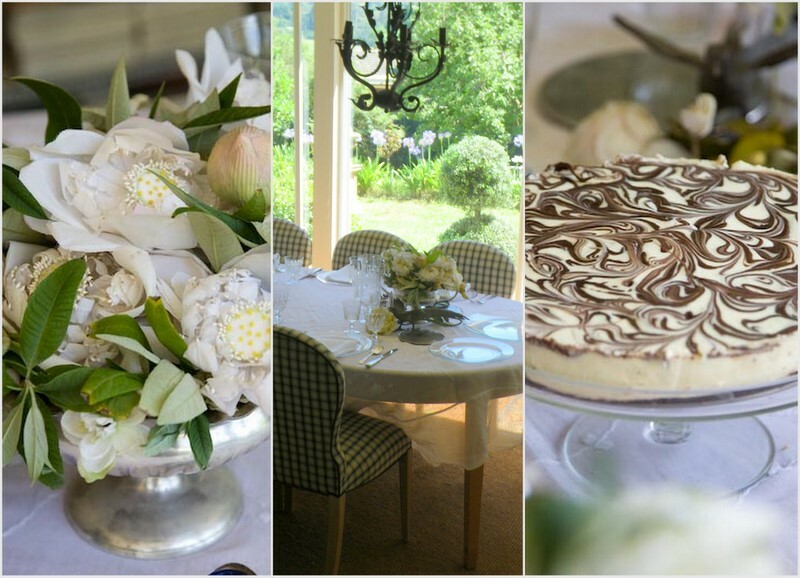 Everything looks absolutely beautiful: your home, the table, the food, the flowers! I've already been over to visit Minna's blog (based on your recommendation). It's wonderful! I can see how you and she became friends with so much in common. I enjoyed the glimpses of a summer's day through your windows. It was a pleasant reminder that warm weather and green grass and leaves will be here again, in our part of the world ... in a few months. Visiting here is like a breath of fresh air!!! Absolutely gorgeous!!! 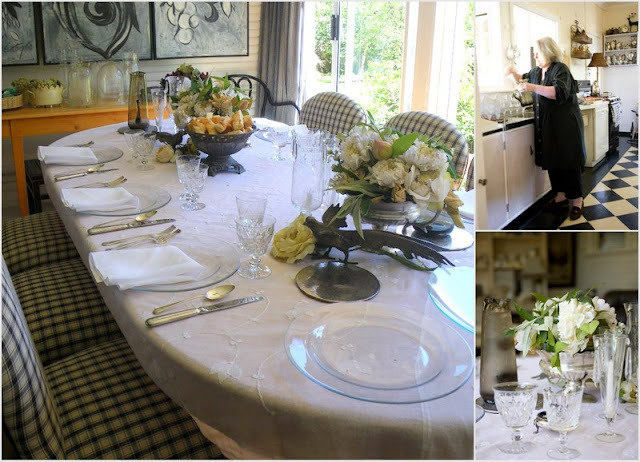 My first time on your blog and it is a stunner....what a beautiful home you have...a beautiful blog...a beautiful table! !....How nice to meet a fellow blogger from so far away....you must have had a wonderful time and are you planning on going for a visit to Sweden in the future?......Sue @ Rue Mouffetard. Beautiful table,and it looks like you had a wonderful time. Loved those green chairs around the table. Thanks for sharing. This is such a beautiful table. Simple, yet very elegant. Thanks for sharing and happy TT to you! Very lovely table setting. Elegant and stylish. What a wonderful lunch! Every time I come here I feel as if I've been transported into a world of beauty and light and greenness. 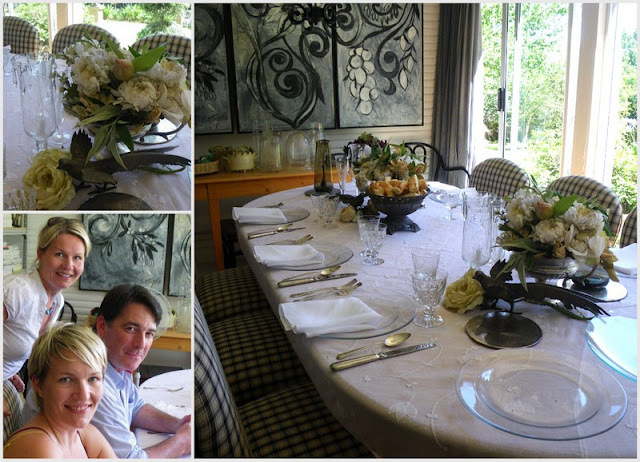 What a beautiful table really set for avery memorable lunch.There's that fabulous painting you did I'd would be transfixed by that all lunch.The photo's give a sense of friendship,sharing and the joy of being together.Home, table everything fabulous. PS: You look pretty youthfuland happy to me. Oh, both this table and blog are prefectly magnificent. Where am I, it is lovely here??? Thank you for all this glorious work! I always look forward to your post. What a beautiful setting. Yeah, Minna is stunning with her smarty ideas. I been following her blog and your blog awhile ago now and I enjoyed it. Jst I didn't have the guts to leave some comments or something. I vist both your blogs almost everyday. My niece is coming in Sydney February 20th as she married and OZ bloke. Living near Parramata. I been in Maitland for a scholarship from Philippine Women's University. Loving OZ land. Unfortunately, I always going back in Melbourne. I left my heart there §;-) And unfortunately, I am living in Stockholm for 22 yrs now and that's the reason not to visit downunder often. So, cheers and have a wonderful and lazy summer. Coty I feel as though I've just opened a beautiful glossy magazine & have been reading a fabulous feature article! 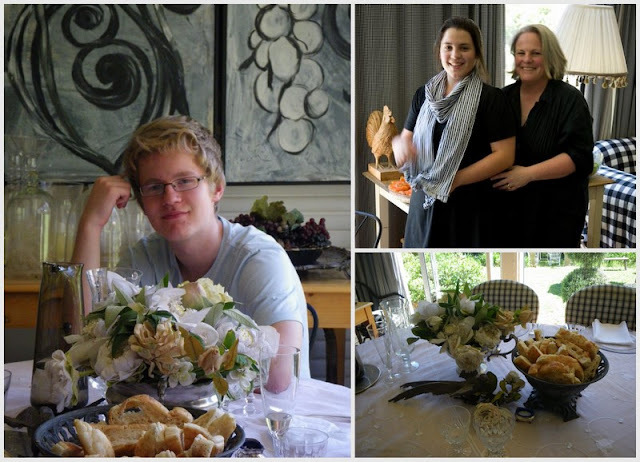 What a treat seeing you & Minna having such a great time together with your families. You are two very talented & delightful girls, I'm so glad you had the opportunity to meet in person in your delightful home. Thank you both for sharing your wonderful photos of your day together. You too look like long-time friends with your warm & relaxed smiles. What a really special time. For the two of you to come together from such distances to be together is a testament to your love of life, family, friends and all the beautiful ideas that you share with each other and thankfully with all of us. I have so enjoyed our long distant phone calls Coty...maybe there is hope that someday the Porters will stop in for lunch at the Farquhars too! What a beautiful post. All your post are beautiful yet this one more so as we get a little peek of your family and your life. I wish I could say my home looked as lovely as yours. Maybe one day when I finally buy a house I will have to call on your expertise but for now I will just continue to live vicariously through your blog! and Miinna's! Im so happy that my one of my best friend Minna finally meet you. She has spoken of you and you lovely style and blog. I have been helping Minna a couple of times in her work and she is the best! Her and your photos are always lovely to look upon. Next week I will work with Minna again. She is going to take pictures of my summer house. We will style the house for Christmas pictures. It will be great beacuse its a lot of snow her in the south part of Sweden. Im sure you will get too see the picture. You are both my favourties!